We have been working on finding equivalent fractions and comparing fractions in math. Some of the manipulatives that we use in class are pattern blocks and fraction tiles. The picture below will take you to a website where the kids can use fraction tiles and circles to make all kinds of discoveries such as equivalent fractions, adding/ subtracting fractions, modeling & identifying improper fractions & mixed numbers, and comparing & ordering fractions. Not only can the fraction pieces on the site be moved or manipulated, but there is also a work space with a drawing tool that the kids can use to write the equations or fractions that they’ve modeled. They can then take a picture of their work and email it, or even post it on their blog! 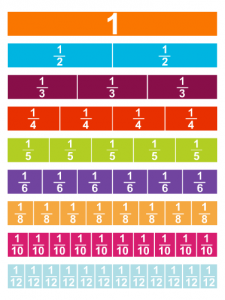 It is also a wonderful resource to use when working on fraction homework! To check it out, click on the picture of the fraction tiles below. This entry was posted in Math and tagged fractions, manipulatives by Mrs. Hunter. Bookmark the permalink.